Blogging is one of the best ways to be in touch with your customers and entice them for new information. Search engines like new content and blogging help for adding new pages to the website. Writing fresh content along with quality is important. Availability of fresh content for readers is also important at a click of the button. Where readers or customers visit frequently? where can they find our articles? find out first. Later post your content at platforms where customers visit. Most of the customers will be available at online forums, online chats and discussions, emails and Social Media. Through social media platforms, you can reach more customers. Some of the people think that if the content is shared once at social media channels like Facebook, Twitter, LinkedIn, Pinterest, Instagram it reaches the target audience. But they don't realize that only half of their job is done. A blog post should be consistently visible for readers. This is possible with the following strategies. Tag a topic or person or brand or specifically related to your blog post. Example: "4 PPC Advertising Tips That Improve Your PPC Campaign Performance " here you can tag word #ppc of your article and while sharing on Social Media sites can give appropriate mention using @ppc and article name or via hashtag. Most of the people who are not on the networking site search through hashtags. A popular post which is written by someone else can be taken advantage to increase the views of your blog post. Example: What Maggie Nestle Could Have Done On Social Media? is popular in social media channels with a lot of likes, shares and retweets then write your views and post on the comment link. Here you can also share this popular post on other social media networks along with your post views for readers. An image or diagram plays the major role in grabbing the attention of the readers. Through this, you can authenticate the accurate information to your audience. Blog posts with data in the title have 170% more chance of being shared on social media. 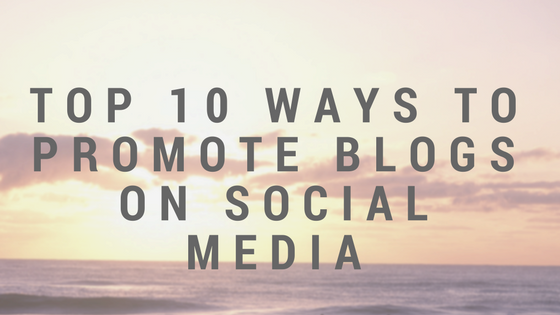 It is another way to promote your blog post indirectly. Start retweeting your every post of your article that you have shared in the social media channel. Create a meme for your post and share it in social media channels. People will engage more with posts attached with memes. Share a quote from your article which is interesting to entice customers to click on the post. Send direct messages to the people whom you mentioned in the post. If they like the blog post or article they will share it. In the comments section post a small discussion about the topic and link it back to your post. Make people participate in the poll like "Google Ads VS Facebook Ads which advertising service is better?" Vote A for Google Ads Vote B for Facebook Ads. The post will get more visibility. The title with questions makes people interesting and feels like he is not aware of the information. Example: "How Is Local SEO Different From Organic SEO?" This entices readers click your post. Thus all these strategies will help you to promote your blog in social media channels.